The strength of the intact rock is one of the most important aspects required to build numerical models for many rock engineering projects, such as open pit mining and tunnel excavations. Numerous failure criteria have been proposed for predicting the intact rock strength. 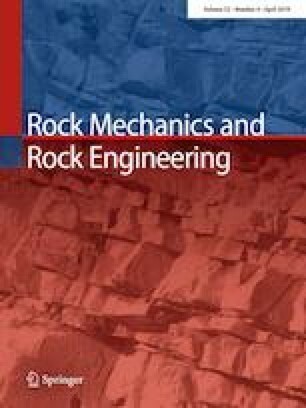 A working group (Alejano and Bobet 2012; Chang and Haimson 2012; Da Fontoura 2012; Eberhardt 2012; Labuz and Zang 2012; Priest 2012) of the International Society of Rock Mechanics (ISRM) on ‘Suggested Methods for Failure Criteria’ was established to standardize the various failure criteria used in practice engineering applications. It is known that the strength envelope of intact coal rock is a non-linear function of the confining stress level (Medhurst and Brown 1998). However, the linear Mohr–Coulomb (MC) strength criterion is still widely used in real engineering applications due to its simplicity and mathematical convenience in the field (Jimenez et al. 2008; Shen et al. 2012; Zhu 2017). The online version of this article ( https://doi.org/10.1007/s00603-019-01775-y) contains supplementary material, which is available to authorized users. This research has been funded by the National Natural Science Foundation of China (nos. 51504218 and 11372363). The authors would like to express their gratitude to anonymous reviewers for their constructive comments on the paper.